For those who work in the social impact space, creating a better future often means spending a great deal of time looking forward, imagining new ways to enact change. But what we mustn’t forget is how important the past is in helping us shape the future with intention. For OpenIDEO, 2017 was a year of rapid scale and change. To help us pause, reflect and share what we’ve learned with our community and innovators in the space, we created an Impact Report for 2017 which we’ve titled Open Reflections. Our hope is that sharing these reflections will help improve not only our own work, but may help the social sector as a whole. In the Report, you'll find stories that inspire us, lessons we’ve learned, questions we’re asking, and even tools you might apply in your organization. Below are a few key questions and themes that we explore in Open Reflections. If these pique your interest, we hope that you’ll read the full Report and share with us what you’re learning as well. How might we be more intentional about who we include in social change work and the conditions we create for their success? The problem: New ideas and diverse perspectives are needed. Our approach: We recruit innovators with different backgrounds from around the world. Our reflection: As our name suggests, OpenIDEO was founded upon the principle of openness. We believe there’s value in enabling anyone anywhere to join efforts to address global problems. Over time, we’ve also learned the importance of proactively and thoughtfully “designing communities” for social innovation—that is, identifying the diverse participants most relevant to a social challenge, learning about those potential participants’ needs, and creating the conditions for these participants to contribute and innovate successfully. We’ve seen how diversity of thought can lead to innovative solutions, which is why we aim to include all kinds of actors in varying roles suited to their unique capabilities. In 2017, we learned a great deal about community design and the importance of being more intentional and effective in including diverse perspectives to address societal problems. How might we support innovators and create impact at scale by designing for depth and breadth? 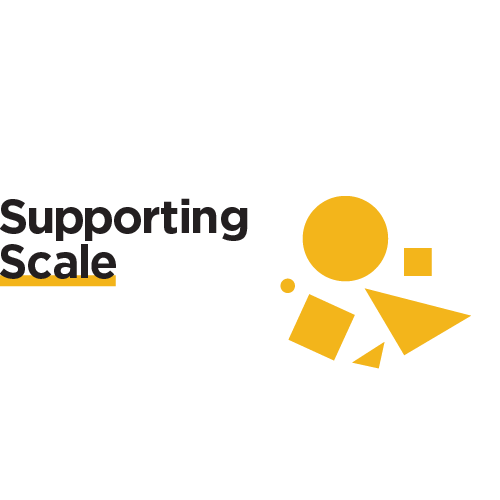 The problem: To create impact at scale, innovators at all stages need support. Our approach: We offer deep support for Challenge Top Ideas, but aim to ensure all participants benefit. Our reflection: We all want our work to drive impact at scale. Many models look to achieve scale by going deep with a small number of partners. Going deep works—and we’ve been excited to see the open innovation process enable funders to make better bets, de-risk innovation, and learn how to best help their new partners test, iterate and grow. But we’ve also seen that focusing exclusively on depth means losing a different opportunity for impact at scale: supporting a large number of innovators in ways that collectively advance the field. Through open innovation, we’re learning about supporting depth and breadth simultaneously. At a minimum, it’s about making sure all innovators genuinely benefit from engaging with us. How might more openness in our work empower more people, fuel collaboration, and drive systems-level change? The problem: For innovation to flourish, we need more collaborative systems. Our approach: We bring stakeholders together and empower individuals at all levels. 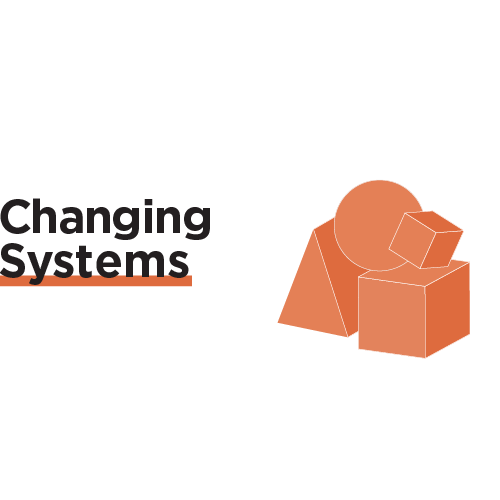 Our reflection: To create the change that’s needed today, we need to consider how we can improve the systems in which we work. Over the years, we’ve learned that by supporting individuals and organizations to innovate, we can also contribute to broader systems change—shifting the relationships and power structures that affect our work in the social sector. We’ve seen firsthand how open innovation can be much more than the process of bringing new thinking to life: it can provide a gravitational pull around which unaligned stakeholders can begin to orbit. While we know open innovation is not a silver bullet, we are optimistic about the impact that well-designed provocation and well-fostered creativity can have. Last year, you helped OpenIDEO grow as an organization and expanded the possibilities for open innovation to help solve problems. 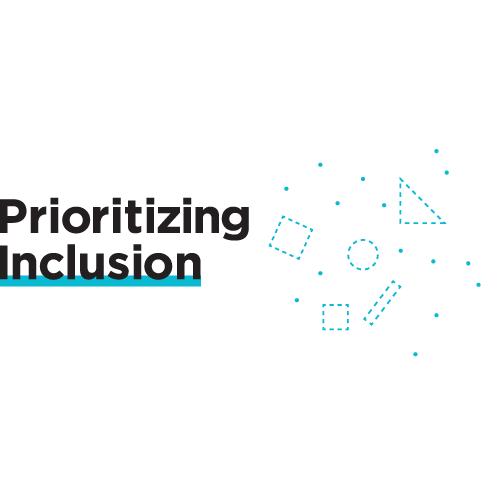 In the process, we learned a tremendous amount about designing for inclusion, scale and systems-level change. 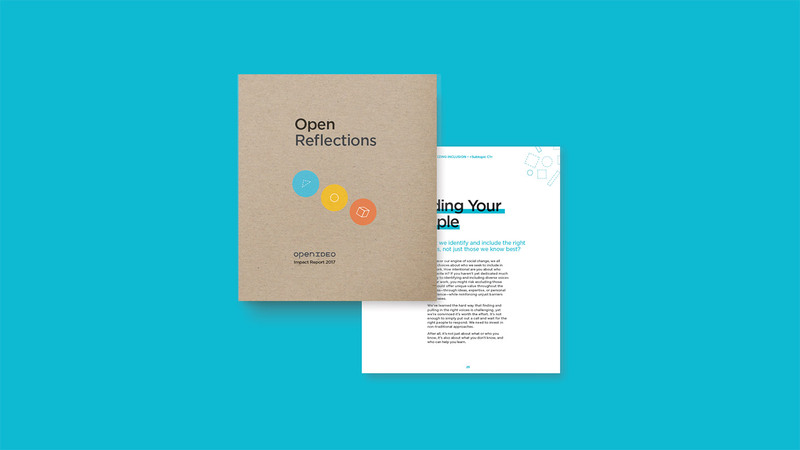 We hope that you’ll read Open Reflections and celebrate the stories of our community, dive into the exercises, and share your thoughts with us so that we can continue to advance innovation in the social impact space together.